Volunteers remove a body from the rubble of a collapsed house in Karachi, Pakistan, following Friday's explosion. 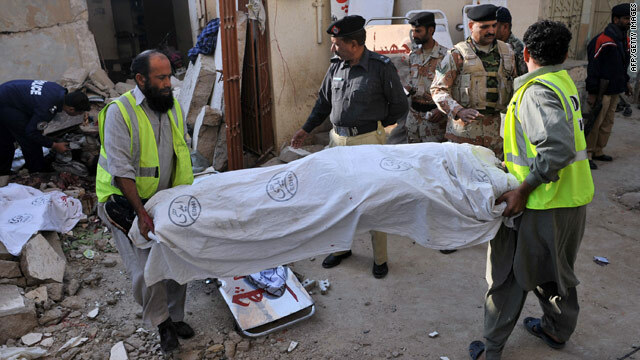 Islamabad, Pakistan (CNN) -- Pakistan's interior minister, citing police evidence gathered after a deadly house bombing Friday, said people at the dwelling had been planning to attack him during a court appearance in Karachi. Rehman Malik, who appeared in a Karachi court regarding an outstanding corruption case against him, said intelligence officers warned him against going to pre-announced events such as Friday's court appearance, which was well-publicized a few weeks ago. The house blast occurred in the Baldia section of Karachi and killed seven people. When police came to the scene, they interrogated three survivors, two men and an elderly woman. They then determined the people were intent on launching an attack on the court, according to Waseed Ahmed, Karachi's police chief. Ahmed said officers also discovered two suicide vests, 25 hand grenades, three AK-47s and 17 magazines of ammunitions. Police also found tins of food, which led them to believe the attackers might have been planning to take hostages and set up a siege of the court. Police were investigating the cause of the blast, and Malik said people in the house were members of a family from the Swat Valley in North West Frontier Province. The Pakistani army has conducted intense operations in that province and the tribal region to rout militants from their safe havens. Malik had been among thousands of bureaucrats and politicians who had been granted amnesty by Pakistan's National Reconciliation Ordinance. The ordinance shielded them from having to face corruption charges. But the ordinance has been nullified, and Malik was no longer protected by it. Also Friday, a suspected U.S. drone strike killed five people in northwestern Pakistan, two intelligence sources said. The suspected drone launched two missiles at a car in the village of Palali, in North Waziristan, a rugged area near Pakistan's border with Afghanistan that is rife with Islamic extremists, the sources said. Two of the dead were from countries other than Pakistan; three were locals, the sources told CNN. The attack, at about 7:45 p.m. also injured two people, the two intelligence sources said. CNN's Pierre Bairin, Arwa Damon and Nasir Habib contributed to this report.